eBay is gearing up for the back-to-school shopping season with several marketing and affiliate initiatives, including Pinterest contests, a Facebook backpack drive, and a promotion for its affiliates. The marketing is designed to increase user engagement with eBay on social media websites, encourage sellers to list back-to-school items, and to reward affiliates for driving traffic to back-to-school listings. eBay is holding a Pinterest sweepstakes where one Grand Prize winner will receive a $5,000 eBay Shopping Spree toward a dorm room makeover. Students must follow eBay on Pinterest (pinterest.com/ebay), create a new Pinterest pin board called "My eBay Dorm Room #eBayCollege," and pin items from "browse ebay.com/backtoschool" on their pinboard. Then, they must complete the entry form on the promotion page for a chance to win. Back-to-school shoppers can also enter for a chance to win a $100 eBay Gift Card by creating a "backpack" pin board on Pinterest - see details on the promotion page. Both sweepstakes end August 31, 2012.
eBay's affiliate program, called the eBay Partner Network, is holding a Back-to-School bonus promotion for Fashion and Electronics. During the month of August, affiliates will have the opportunity to earn extra cash for driving incremental revenue in those two categories. 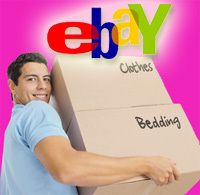 See details on this eBay Partner Network blog post. eBay also has a gift guide where shoppers can find Fashion, Electronics, Textbooks and School Supplies and a "Back to School Hotlist" for sellers. It is also running a promotion on the eBay Facebook page in which it will donate up to 5,000 backbacks full of school supplies to children. See more about eBay's back to school marketing efforts on the eBay announcement board.